Award winning creative partnership Christine Wilke and Jane Hancock launched Loulou in 1991 after graduating from the prestigious London College of Fashion. Christine graduated in Design and Jane in Pattern cutting. Loulou began as a bridesmaid label and the company was soon successful because Christine and Jane shared a passion for innovative design. Loulou quickly became one of the leading Bridesmaids labels. The company won the coveted ‘Best Bridesmaid Design’award at the British Bridal Awards for four years running. Its dresses appeared on popular television shows including ‘The Clothes Show’ and popular soap operas. Loulou’s profile grew and the company had many stockists across the country. Aware that Loulou dresses were often worn for other occasions, in 2007 Jane and Christine seized the opportunity to design a prom range, a bright, funky and stylish collection that was at the cutting edge of British design. 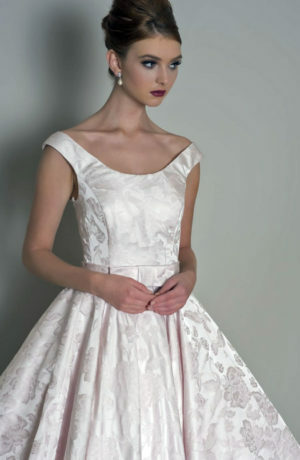 In 2009 Loulou launched a range of simple, well-cut, elegant yet affordable wedding dresses. It proved to be another turning point in the history of this successful, innovative company and evolved into their vintage-inspired signature look.